A simple and sensitive method for analysis of 1-OHP-G in urine to evaluate PAHs exposure was established. The urine was extracted with a OASIS PRiME HLB column, and the eluent was directly injected into HPLC–FLD for analysis. The separation was carried out on a ACQUIIY UPLC BEH C18 column (2.1 × 50 mm, 1.7 μm), using methanol–1.5% formic acid water (60:40, v:v) as mobile phase at the flow rate of 0.2 mL/min. 1-OHP-G was detected at the excitation wavelength of 338 nm and the emission wavelength of 379 nm. Good linearity was obtained from 0.010 to 5.0 ng/mL for 1-OHP-G. 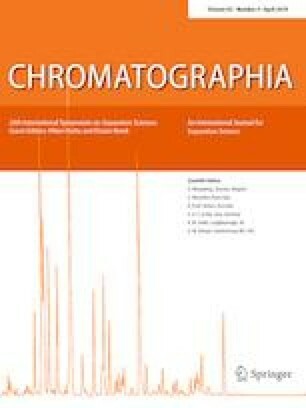 The limit of detection of 1-OHP-G was 0.0032 ng/mL and the limit of quantification was 0.010 ng/mL. The intra-day and the inter-day precisions were 1.68, 4.98 and 1.81%, 5.00% at the concentrations of 0.010 ng/mL and 5.0 ng/mL, respectively. The proposed method was applied for urine sample analysis and the whole procedure could be completed within 8 min with the recoveries of 91.9–109%, 92.7–107% and 94.5–107% at the concentrations of 0.010 ng/mL, 1.0 ng/mL and 5.0 ng/mL, respectively. The results of 41 urine samples from non-professionals measured with the proposed method and UPLC–MS/MS were compared by Bland–Altman test and Passing–Bablok regression, showing a good agreement between the two methods. Moreover, dynamic change of urinary 1-OHP-G after eating barbecued food was detected by the proposed method and the results were consistent with the reported researches about 1-OHP. The proposed method was simple and rapid, and it could also to meet the assessment of population exposure to PAHs with high sensitivity and accuracy. We would like to thank the Public Health and Preventive Medicine Provincial Experiment Teaching Center at Sichuan University and Food Safety Monitoring and Risk Assessment Key Laboratory of Sichuan Province for providing the experimental platform. All authors declare that they have no conflict of interest to declare. All experiments were performed in compliance with the relevant Chinese laws and with the 1964 Helsinki Declaration and its later amendments or comparable ethical standards and the whole study was approved by the medical ethics committee of West China Second University Hospital, Sichuan University. Human urine samples, used for the development, validation of the method and dynamic change research, were obtained from healthy donors in West China Second University Hospital, Sichuan University, after their informed consent, and then stored at − 80 °C until analysis.